The Standard Range Kit is suitable for soil pH measurements from 5.0 to 7.2. This kit contains two indicators in plastic bottles: 1) Chlorphenol red (soil pH range 5.0 to 6.2) and 2) Bromthymol blue (soil pH range 6.0 to 7.2). Also included is a white spot plate, a standard color chart for the 2 indicator solutions at various soil pH values, an instruction sheet, and New York general lime rates to obtain soil pH values of 6.2, 6.5 and 7.0 for sandy loam, silt loams and silty clay loam soils. The Wide Range Kit is suitable for measuring the soil pH over the range of 4.0 to 8.6. It contains the standard range kit and an additional 2 indicators: 1) Bromocresol green (soil pH 4.0 to 5.6) and Phenol red (soil pH 7.0 to 8.6). The wide range kit is particularly useful for problem solving situations, soil classification purposes, and determining soil pH for unusual plant growing conditions, such as rhododendrons or alkaline soils. The Low Range Kit is suitable for soil pH measurement from 4.0 to 6.2. This kit contains two indicators in plastic bottles: 1) Bromocresol green (soil pH range 4.0 to 5.6) and 2) Chlorphenol red (soil pH range 5.0 to 6.2). 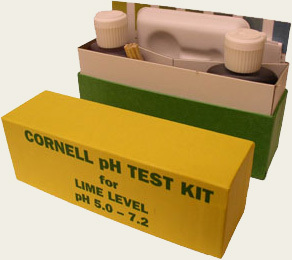 The low range kit is useful for assessing acidity in the soil. If you are looking for bulk reagents, you may contact a NYS CCE (Cornell Cooperative Extension) office in your county or an adjoining county to purchase bulk indicator solutions through them. If you need assistance locating a CCE office for this please contact Beth Woodring at eab13@cornell.edu. Thank you!